A ‘parrot trail‘, partly created and now entirely run by a Local Conservation Group (LCG), is improving conservation prospects for the globally threathened Hispaniolan Amazon Amazona ventralis in the Dominican Republic and helping raise awareness across the border in Haiti. Hispaniolan Amazon Amazona ventralis was once common across Haiti and the Dominican Republic, however, during the 20th century the species declined rapidly and is now largely restricted to mountains in the island’s interior. Trapping for the local pet trade is a particular concern and the species is listed as Vulnerable to extinction on the IUCN Red List. Most Dominicans are familiar with parrots as captive animals, but few have seen them in the wild. Consequently Grupo Jaragua (BirdLife in the Dominican Republic) has been working with a Local Conservation Group (LCG) from the Jaragua National Park IBA to design a ‘parrot trail’ that enables visitors to encounter parrots in the wild. It is hoped that by seeing wild parrots, often for the first time, visitors will be made aware that ‘pet’ parrots are sourced from wild populations and from natural habitats which are both at risk. The LCG—Voluntarios Comunitarios de Jaragua (VCJ)—was involved in every aspect of designing the trail. A visitor brochure with a map and basic information on parrots and other wildlife has been produced. The trail is now self-sustaining, requiring no more than occasional maintenance which VCJ members are able to carry out. Women constitute about half of the membership of VCJ, and the trail has been designed with children and young adults as a priority. 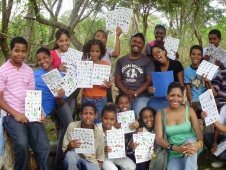 The trail was tested by six groups of 15 to 20 children from the Grupo Jaragua Summer camp in July 2009, and also with a school group from Santo Domingo in May 2009. Children from Oviedo, Tres Charcos, La Colonia, El Cajuil, and even the Haitian town of Anse à Pitres, participated in the Summer Camp visit. The trail provides a learning and behavior-changing experience like no other in the Dominican Republic, and has greatly improved the prospects for parrot conservation. The experience, and the materials created, are now being shared with other LCGs in the Dominican Republic and Haiti.